Luca Guadagnino’s remake of Dario Argento’s beloved supernatural Giallo, Suspiria, is finally upon us, and it’s gloriously deranged. Thanks to David Kajganich’s screenplay and Guadagnino’s masterful direction, Suspiria (2018) doesn’t skimp on plot and gives viewers plenty to chew on. Germany, 1977. A darkness swirls at the center of a world-renowned dance company, one that will engulf the troupe's artistic director (Tilda Swinton), an ambitious young dancer (Dakota Johnson), and a grieving psychotherapist (Lutz Ebersdorf). Some will succumb to the nightmare. Others will finally wake up. Argento’s 1977 phantasmagoria, which has little to offer outside of its score, lush, vivid cinematography, and atmosphere (of which it has plenty), remains beloved amongst horror fanatics and film cultists. So, Guadagnino and company had pretty large shoes to fill here, and I feel as though they’ve risen to the occasion and crafted something sinister and stirring, full of the foreboding ambiance of Argento’s film, but with an extra emphasis on story and plot. More of an expansion than an out-and-out remake, Guadagnino takes the necessary time (roughly an extra hour) to flesh out the story of Argento’s original, resulting in a slow-burning feminist fable, twisted and contorted with a deeper sense of meaning. Even though, it sometimes feels at odds and awkwardly blended with its central storyline, screenwriter David Kajganich makes good use of setting as a subtextual backdrop and also places the art of dance firmly in the forefront as a major plot device, which gives logical context into the motivation of the coven and reveals the dance academy’s true function. Guadagnino uses these dance sequences to really stress the mystical evocation capable with each body movement, which really add to the film’s transfixing quality. Broken into 6 chapters accompanied by an epilogue (and a brief post-credit scene), Guadagnino’s vision is nothing short of epic. He utilizes the appropriately inflated runtime to steadily get under the audience’s skin until his “hooks” are in so deep that you are powerless to the horrors that ominously lurk. And while there are many horrors that lay in wait, Guadagnino cares not for the cheap scares. No, he wants to get into your head, and he does so with masterful force. While there were moments that didn’t exactly land with me subplot-wise, there were a lot of sequences that I absolutely adore and several that cannot be unseen or easily forgotten. In particular, a lengthy dance sequence juxtaposed with a dancer trapped in a studio, her body contorting into inhuman positions, piss dribbling down her tights, is as deeply unsettling slice of body horror quite unlike anything I’ve ever seen, which is as deeply scarring as the climax is euphorically disturbing. 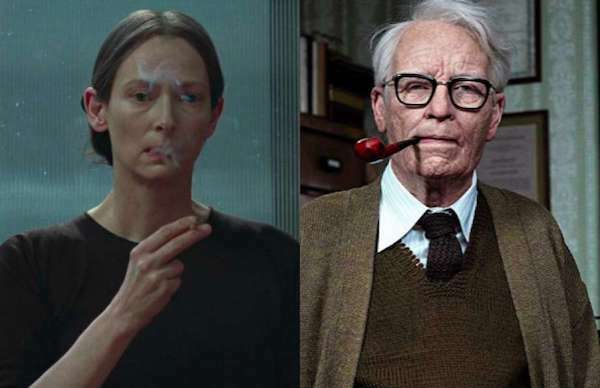 Far and away the biggest delight the film offers is Tilda Swinton’s triple performance as Madame Blanc, Mother Markos, and (surprisingly) Dr. Josef Klemperer, who is credited as Lutz Ebersdorf. Her work as Dr. Klemperer is absolutely transformative, and I was completely unaware it was her. Dakota Johnson also gives a very physical performance of note, and she goes toe to toe with Swinton in several scenes. Everything is set to Thom Yorke’s score, which is fantastic on its own right, but doesn’t always gel (mainly, just whenever vocals are present) with the tone or visuals of film. Overall, Suspiria is a solid cerebral horror film and a fantastic remake. I appreciate that Guadagnino did something very different, all while being true to the ominous spirit of the original. This one had me stumbling out of the theater, not 100% certain what I’d just seen, but knowing that it was something very good. It still haunts me (in a good way). Recommendation: This one is not for everyone. Fans of arthouse or psychological horror, the original, or those who enjoy a film that challenges them may get the most out of it. If you don’t want to use your brain, you better sit this one out. Rating: 4.5 dances of another outta 5. What did you think? Did Guadagnino’s Suspiria work for you? Is it better than the original? We want to know. Share your thoughts and feelings in the comments section below, and as always, remember to viddy well!